Scottish Hotel in Sri Lanka. What's on the menu? Happy Holidays! Updated stock at Poker Brat, new book! Sexton Speaks: "partypoker is On the Rise"
"Small Potatoes Poker & Sports Betting"
"Sleep With the Fishes, Dine on the Whales"
2017 in Review: Remember these WTF Moments? "Rime of the Ancient Mariner"
The break and the comeback! Win a £3,500 trip to Vegas for £2.20. In 30 minutes. Doug Lee, biggest toolbox ever? "A Song for Dave Ulliott"
"A Song for Lucy Rokach"
Poker is a form of gambling. This is a true statement, and certainly one that would be held by the average member of the public. However, for the professional poker player; and really any one who wishes to make money from poker; the gambling aspect of poker must be reduced as much as possible. Poker is an ‘exception to the rule’ in terms of gambling. It is the only game that isn’t played against ‘the house’, therefore differing from blackjack, roulette, craps and all other casino games. If you played all those games to infinity, you would be guaranteed to lose money. However this isn’t necessarily the case in poker, assuming you have an edge against the players you are playing against, and can beat the rake that the poker room charges. Of course, luck is a big factor in gambling, and it is a hotly debated subject in poker whether it is a game of skill or luck. I am on the fence on this one. It is a game that includes both elements. However, to be a profitable poker player, it is important to make the ‘luck’ factor of the game as small as possible. This is very important for reducing the gambling aspect in poker. If you have your whole bankroll on one table, you can get your money all-in preflop with AA against 23, they hit quads, and you’re out of the game. However, this scenario is very unlikely to happen 50 times over, and assuming you are a good player who often gets your money into the pot with the best hand, playing a game with 1/50 of your bankroll should feel fairly safe, and less like gambling. If Omaha is your game, it’s generally accepted you need double the amount of buy-ins that you do for Texas Hold 'em. Quite simply, the more hands or tournaments you play, the more luck will even itself out, allowing any edge you have in the game to come through. So the professional poker player needs to put in the hours if he desires to have any kind of expected income. I’d suggest 30 hours a week is a minimum. This is another way to combat the ‘luck’ element of the game, as while you are busy having your Aces cracked on one table, you can be outdrawing AK with AQ on another table. Be careful though, as although it decreases variance, less concentration can be put into each table so you will be playing each one worse. For me, I can play 2 heads up tables at once, 4 cash game tables at once, or 6 STT tables at once, but anything above that is beyond me. Some people can manage much more, others less, it’s about what you can play comfortably. 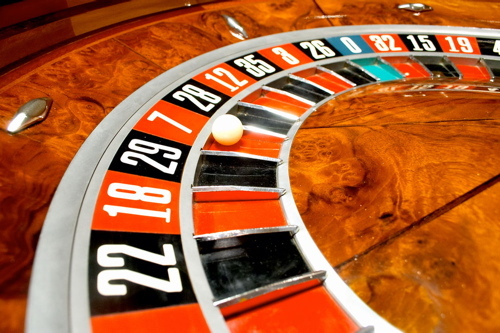 If you are gambling, there are going to be times when you are losing money, no matter how lucky you happen to be. Often when losing money, people don’t know how to stop. The infamous gambler Archie Karas is an extreme example of this, as he amassed $40 million from gambling, and went on to lose every last penny. Losing money puts people on tilt, and if you recognise that you are tilting, and playing worse than usual because of it, you need to take a break from playing. If you are thinking of calling for all your chips with only a flush draw when you don’t have the odds to do it; just because it’s a quick way to make back some money; take a break. Otherwise you are just gambling, and this article is about distancing yourself from the gambling side of poker. It’s human nature not to want to be down in cash at any given time, but sadly in poker this is inevitable and something you must be able to deal with. I often feel much better about a loss the day after it happens, so for me it is important to stop playing for the rest of the day if I have a really bad session. Your ‘edge’ at poker is the only thing that stands between you and gambling. If you are the worst player on the table, you are simply gambling; hoping to get lucky. The average poker player is much better in 2009 than they were in 2005, and the edges are getting slimmer. Therefore any way you have of increasing your edge you should look into. This goes for reading books, joining poker forums (blondepoker.com FTW! ), reviewing your hand histories, watching training videos, or simply talking poker with other poker enthusiasts. Poker is a form of gambling, but this notion can help you improve your game. Make sure you do all the things possible to make sure the skill aspect of poker overrides the luck factor. 7 Comments to "Taking the Gamble out of Poker"
Online poker has become increasingly popular in the last few years and Celebrity Poker on TV has made it even more popular than ever. Since poker has become such a popular online game there are now literally thousands of sites that offer online poker for people to play. Good article mate - It drives me absolutely insane explaining to people that poker is not the same as roulette etc. I might just print this out and shove it in the face of the next person that insists poker is evil gambling. Maybe in the next article you can detail what ratio of luck/skill you used to ship two back to back comps in birmingham! Good read dude. I need to learn me some of that bankroll management. lol! Smart post, you have a good blog. Thanks for the post, very well thought out and informative, especially the bankroll management aspect. Week 4 review - "Confidence Boost"